Over 40 years ago, at the bottom of the garden of my grandad's house, there was a small wooden shed full of sawdust, and old tins that rattled if you shook them. I heard that sound again last week when I started a G4 iBook: a sure sign of a broken hard disk. A few days before I had an email asking for help. The young lady had had her iBook for about three years and it had stopped working. The shop it was bought from wanted almost 40,000 baht for a new main board, hard disk and battery: at that age, a new computer would be a better investment. I asked if she had AppleCare, but that had not been purchased. Broken hard disks or logic boards may be covered for an extra two years after the normal worldwide warranty, if they fail in normal usage. That does not include coffee spills, or cat scratches, although some people have tried. 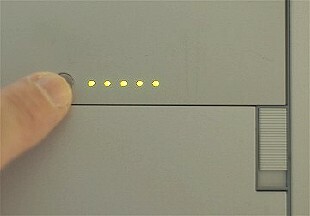 As I took the iBook into my office, I turned it over and pressed the charge-level button. Five lights are displayed when the battery is full. While charging, one or more are lit and one light flashes. With no lights here, the battery was not charged, or dead. I connected the power supply and pressed the power button. That was when I heard the box of screws. The young lady confirmed that the sound happened sometimes (do we ever mention in Database about backing up data?). Whatever was happening, the iBook did not want to start up. I put an OS X Tiger disk in the DVD slot at the side, pushing it in as far as it would go, then pressed the power button and the C key. The disk was sucked in fully and the Apple logo appeared, then the spinning "gearwheel", and then the blue screen. Finally a panel appeared asking me to select a language for the computer. I chose English and continued to the first Install screen. Instead of putting on a new operating system, I opened the Utilities menu and started Disk Utility. At the left of the First Aid panel a list of accessible disks appeared, but there was no hard disk shown there, just the Matshita disk drive and the Apple DVD. I closed the application and stopped the installation disk. I had to restart the computer once more to remove the DVD by holding down the track pad at startup. A few weeks before I had been contacted by an American here who had managed to avoid recycling two G3 iBooks. While a Performa he had really was dead, the iBooks were resurrected for quite reasonable fees at Mac Home Service in Samsen. I retrieved the email that gave me details, accessed the website and the young lady copied the information. As the next morning was a Saturday, I decided to have a look myself. Fortunately I had a patient taxi driver as it took a while, cruising along Sutttisarnwinitchai Road (between Phahonyothin and Vipphavadi Rangsit Roads). We asked some motorcycle taxi riders for help: "Make for the Esso station: the apartment block just next to that". Even going into the Free Way Apartment complex was a little daunting as the premises of Mac Home Service were tucked round a corner; but as was later pointed out to me, there is a map on the website. I had looked at the Macs for sale pages, but not gone all the way down to the bottom of the Thai list. There is a link to the map here. I met the owner, Prakob Thanomteeranont, at the door and chatted with him and Ms Tippawan along with one of their technicians, Jirasak, who had a keyboard disassembled on the work bench. I mentioned the young lady: "Oh yes, she has been here already and we fixed it. We are charging the battery now." The cost was the hard disk plus a couple of thousand for the work on the main board. 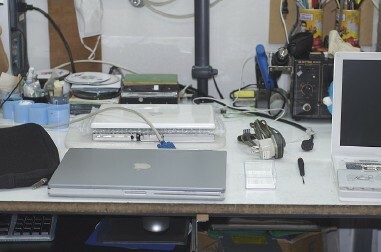 Although the workshop area was small, I was impressed with the cleanliness and order: not always easy in a repair shop. 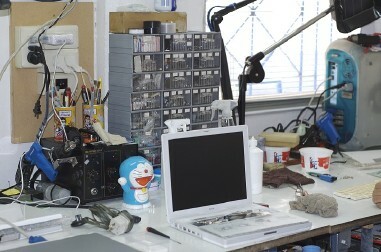 The workbench was organised although in use. 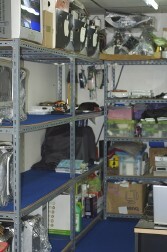 Computers were neatly placed in racks, electrical spares were in labelled, transparent drawers and the carpet tiles were spotless. This is a well-organised shop. Warranty work is best done by authorised agents who have access to all spares needed for the latest Macs, but there is a grey area that exists when some of our machines are a bit long in the tooth. At top rates, it is probably economical to move on, while the computers themselves could still serve as e-mail machines, browsers or word processing machines for quite a while to come. 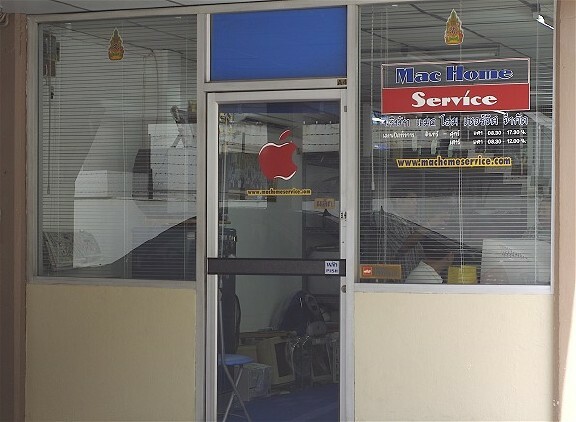 In those circumstances a repair by a shop like Mac Home Service may be preferable.